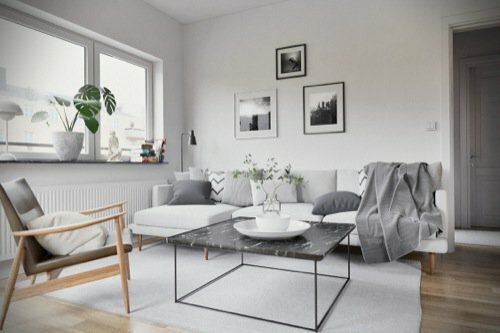 The best way to improve your skills in Blender as an architectural visualization artist is in practice. We always recommend to our students to get as much practice as possible. If you don't have a project in development, you can use any design magazine and use as a reference. Taking a real scene and reproducing it in Blender is a powerful way to improve your skills. Do you want to see an example of a real space reproduced in Cycles? Here is another impressive work from Greek artist known as SunBurn in the BlenderArtists forums. His inspiration for this project is an existing apartment in GoÌˆteborg, Sweeden. He made a few adjustments to the project and created an impressive set of images. According to the artist his primary objective was to create a realist set of images, even adding some small mistakes in both the layout and in the image composition. For instance, he manages to add some film grain in darktable as a way to make images look natural. The furniture in the scene is a mix of models found online and some other objects the artist modeled them himself. From the description, we can also look that he used a GTX 1060 for the render. Each image took about 40 minutes to render using that hardware. To achieve that render time he uses the Denoising feature of Blender Cycles. In our last analysis of graphics cards for architectural visualization, we placed that model in the budget section. Even in the budget section of GPUs you will find that for such quality of images and render times, it is a great deal. You probably will have to be careful about texture sizes, but for residential interiors, it is more than enough. The challenge will be to find those graphics cards nowadays, with the cryptocurrency madness taking the GPU market by storm.